There are very few places in the world, including Malaysia, that remains untouched by greedy humans trying to make money out of natural resources without a thought for the consequences. 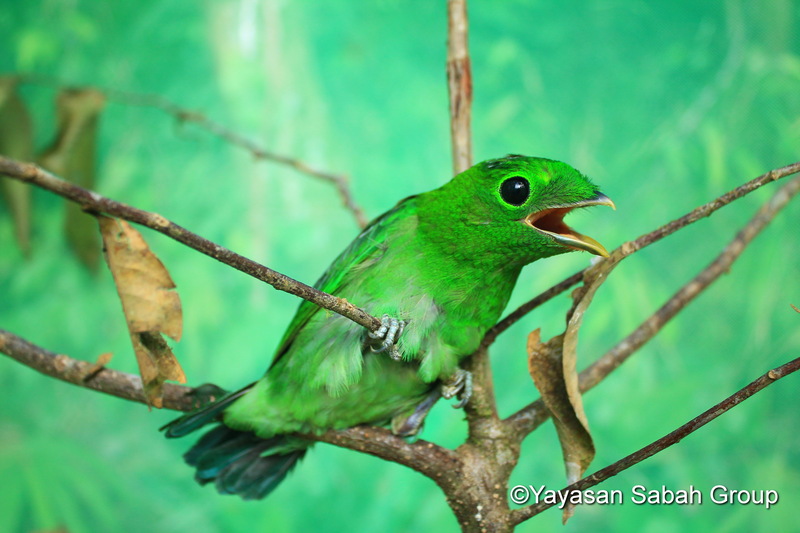 But despite that, there are still a few left, and one such heaven is the Imbak Canyon Conservation Area (ICCA) in Sabah. 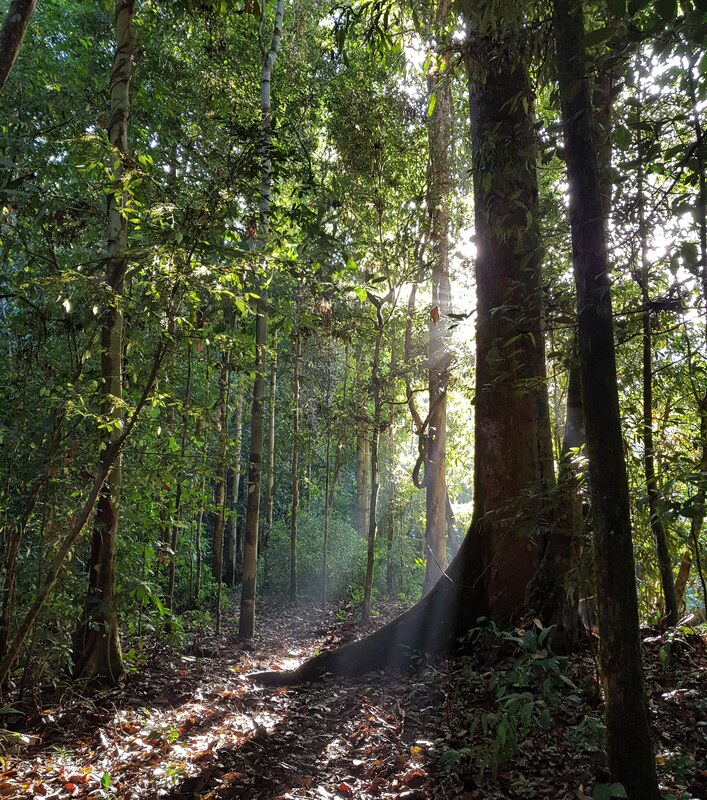 The forest will remain (hopefully) unmolested, thanks to Yayasan Sabah -- which had a huge hand in getting the forest gazetted as a protected area -- and Yayasan Petronas, which gave a funding of RM83 million. 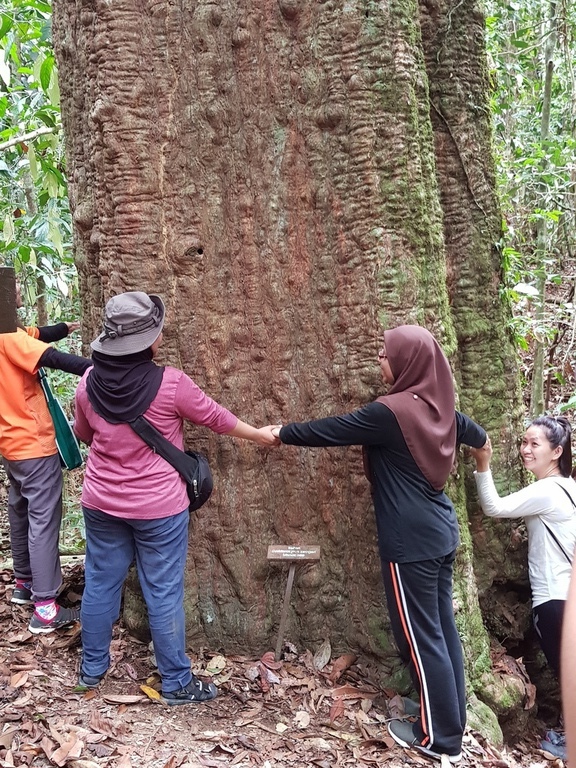 The funding goes towards building the Imbak Canyon Studies Centre (ICSC) that's set to be a hub for research into biodiversity, education and awareness programmes and other activities. 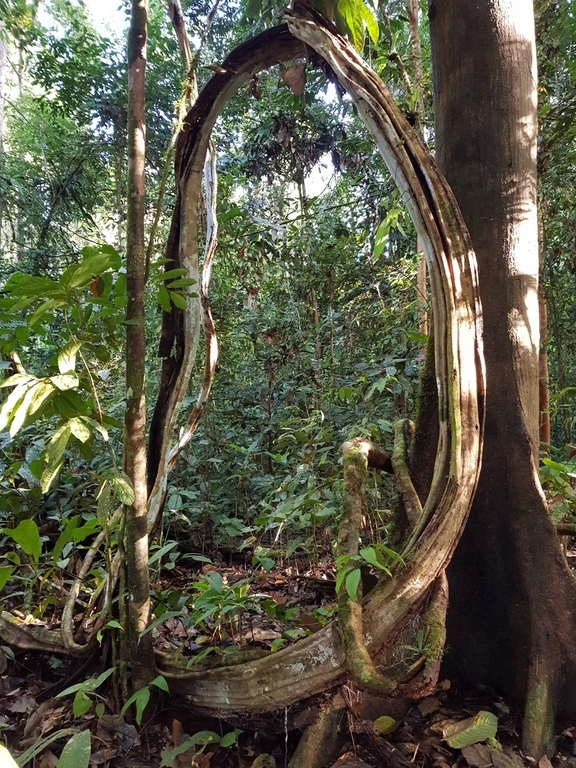 For the launch of ICCA, a group of people from the media got to experience the virgin jungle, and over a week later, many are still gushing over the beauty of the place as well as the work that's being done in the conservation area. The journey to ICCA was not an easy one. A bunch of us travelled from Kota Kinabalu in four-wheel-drives (4WD) and it took us almost eight hours, including lunch and toilet breaks to get there. Technically, Imbak Canyon is not that far from the nearest airport. It's about 300km from Kota Kinabalu and 220km from Sandakan (yes, it's faster to get there from Sandakan). However, the final leg of the journey is on unpaved roads, so the going is slow and rocky. For some of us, it was our first experience riding in 4WDs on rough terrain and it was definitely fun. We could *almost* understand why some of the drivers do it as a hobby. It's not for someone who gets car-sick easily, though. If you do get nauseous easily, do take medication before embarking on the journey. 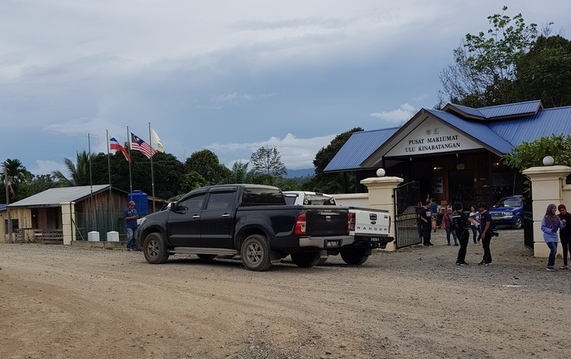 Before we reached ICCA, we made a stop at the Ulu Kinabatang information centre in Kampung Imbak - the closest village to the conservation centre (about 30KM away). This centre was built to help visitors as well as the locals to understand more about ICCA/ICSC and its surrounding area, the importance of conservation as well as the evils of poaching and logging, among other things. If you need any provisions, this is a good place to get them. The village also has homestays and 4WD rentals. 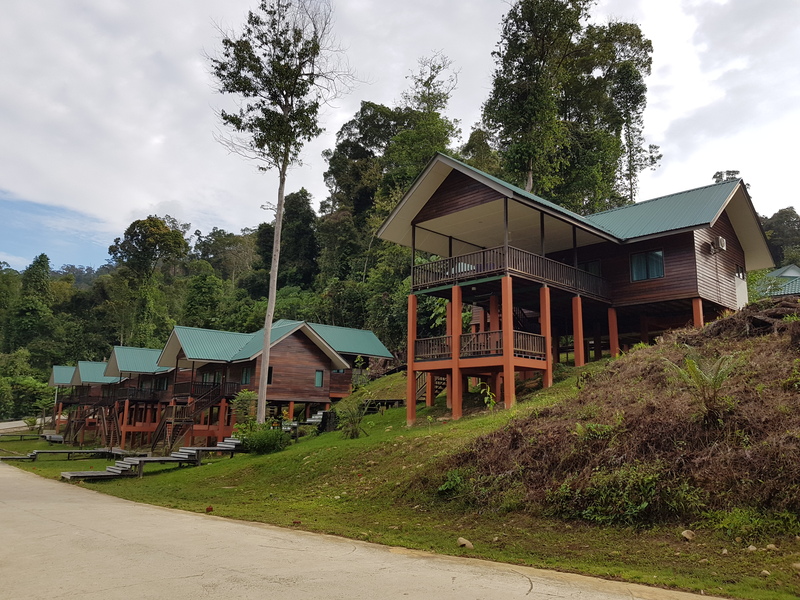 In the event that you get all adventurous and choose to take the risk of driving a non-4WD car up to that point, you can also try and rent one that can get you the rest of the way to Imbak Canyon at the village. 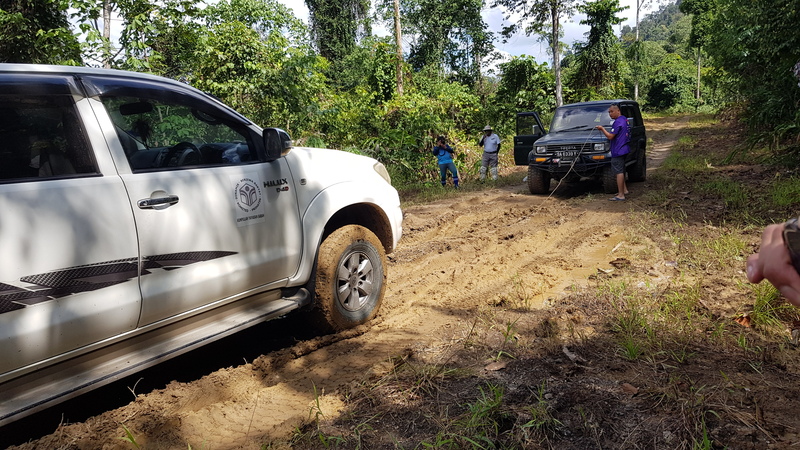 After a quick tour where we also got to see a scaled model of Imbak Canyon and the parts that has been explored by researchers, we finally made our way to ICCA driving across the Kinabatangan river. The river was quite dry when we crossed it but according to our driver, Ismail or Pak Mail, it isn't always so. "Last time, when Maya Karin and Remy Ishak visited, the bridge here was swept away. He helped us rebuild it. Not bad for an actor," he said, telling us about the time both the actors visited Imbak Canyon. Their visit to the conservation area in 2013 is something that's still talked about with fondness. According to those we met, there's even a waterfall named after Maya Karin - the Maya Waterfall, which some from our group managed to visit. When we reached ICCA, our phone lines were lost, thus our connection to the rest of humanity. At least, for most of us. There were instances where we could get messages in and out on the first, second and last days, but the third day saw us entering the deeper jungles where there was zero connectivity. It was absolutely freeing not to be constantly on our phones. If you're looking for a digital detox, this place is perfect for you. So anyway, on the second day, we first got a tour of the building at ICCA (built mostly from the funding from Yayasan Petronas). The facilities are pretty impressive - with living quarters for researchers, research assistants, visitors, a lab, dining and conference rooms and even a mini garden for those who are not fit enough to go for an actual hike. There are also six suspension bridges within the area, surrounded by greenery and a gallery where there are infographics and such about Imbak Canyon, some of the findings from the researches done there and the progresses made since the area was first gazetted till today. 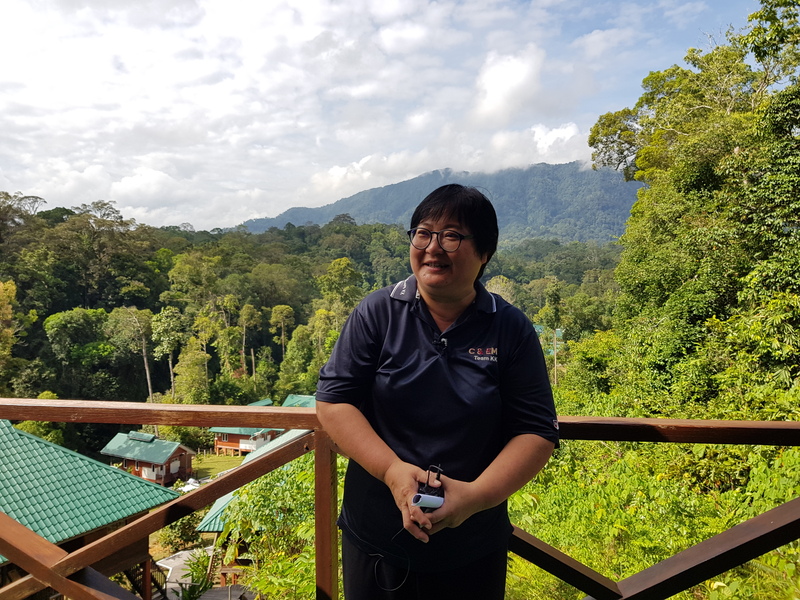 We were lucky to have met Yayasan Sabah's Conservation and Environmental Management Division Group Manager Dr Yap Sau Wai, who explained to us the importance of the facilities built in Imbak and the work done by scientists there. For example, one of the major researches that is done at the centre is the pharmaceutical properties of flora found in the jungles - and the researchers engage with locals to learn more about the plants that are traditionally used by them. As Dr Yap explained this, she casually walks over to a plant and said "...these leaves, if you pound them and put it on bleeding wound, the bleeding stops immediately." Whoa...cool! Why don't we have these available everywhere, we don't quite know. But we sure hope the researches done at Imbak will bring about positive changes in the lives of many. 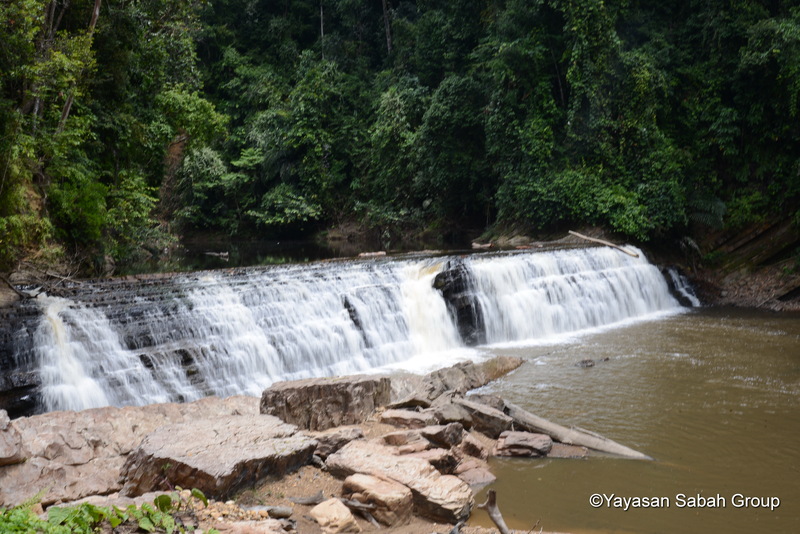 This was followed by a trip to the Imbak Waterfalls, which can be easily reached by 4WD or even trekking. The waterfalls is not very high, but is wide. The water may not be as clear as the other waterfalls and rivers in Imbak, but this is caused by the water running through vegetations and such. Don't worry, it's safe to take a dip but due to the limited time we had, none of us did. 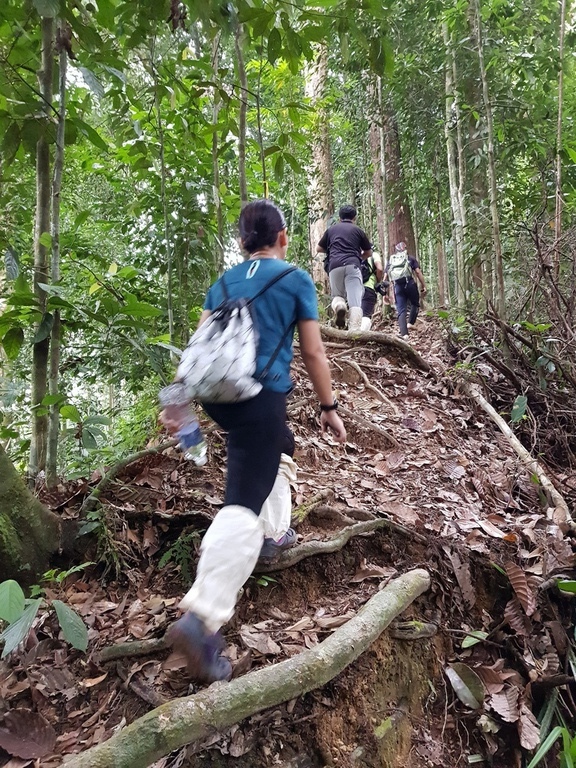 There are more trekking trails around Imbak Canyon and we got the chance to trek one of them. It was a pretty easy trek, with the rangers telling us much about the forest - from the types of flora and fauna found to the different sounds birds make, and how to detect illegal poachers and the signs they leave behind. The highlight of the trek, however, was the Big Belian Tree - the oldest tree spotted in the jungle so far. We were told that the tree is estimated to be about 1,000 years. However, it's hard to say for sure as unlike trees in countries that has four seasons, the trees here don't have rings that indicates their ages. The age of this tree was determined through measurements done over a few years. It was estimated that the tree grew about 0.5mm in width every year, which led to the conclusion about the tree's age by researchers. The Belian tree has many uses - from material to build coffins and boats to making a sumpit. According to one of the rangers, Koh Ju Ming, the longer the belian tree barks are in salt water, the prettier and sturdier it becomes, making it a favourite among local tribes to use in boat-making. Once we were done with the tour, we packed enough to spend a night in the jungles and got back into the 4WDs. It has been mostly dry leading to the time we visited the place, but weather was starting to change, making the earth soft. One of the 4WDs got stuck in the mud and had to be pulled out. Our driver explained that often, the trips are made in a group or at least with another vehicle because such incidents are not uncommon. It also helps to have experienced drivers who can navigate such roads. 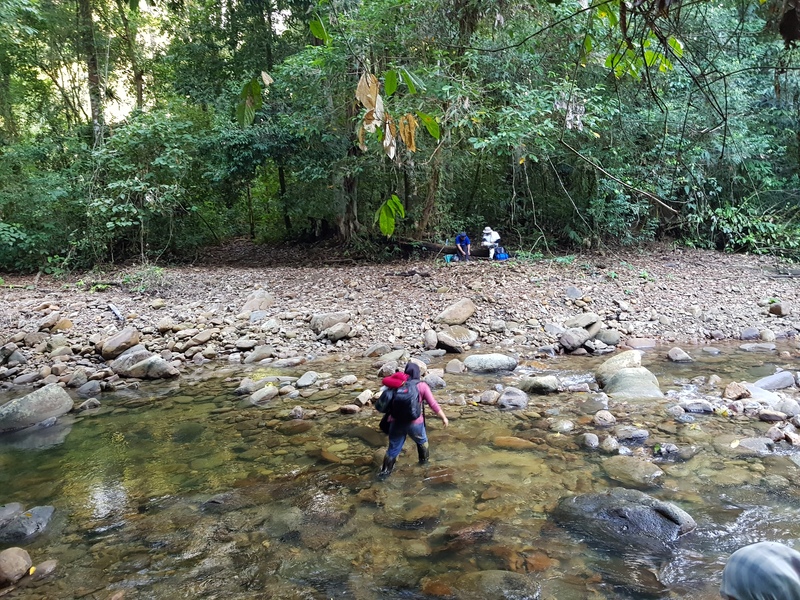 About an hour ride later, we prepared ourselves to trek and walk through rivers to get to the Gunung Kuli Research Station. It took us about 40 minutes or so, including the time taken to admire and photograph the amazing view along the way. It really is difficult to just forge ahead without stopping every few minutes to exclaim at something new we discovered or the way the sunshine just turned everything magical. While the trek was enjoyable, it proved too much for some. 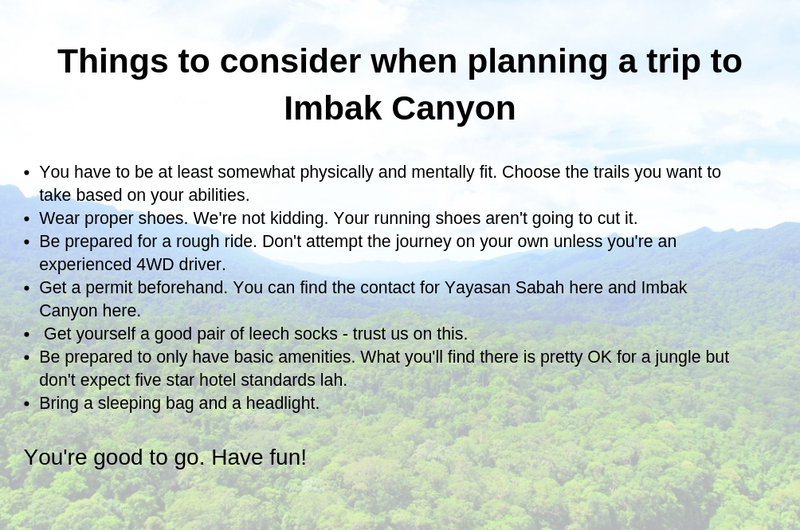 You need to be at least somewhat fit to explore Imbak, as the paths are not as well travelled as more popular spots. It also doesn't help that the soil tend to be loose so slipping is not an impossibility. 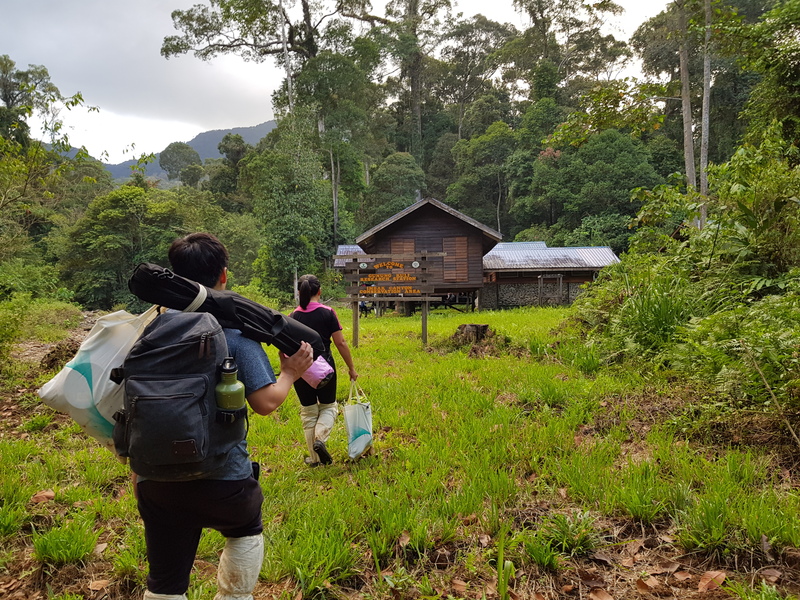 Once we reached the Gunung Kuli Research Station, we were all given a place to sleep. The guys in the group had to sleep in the kitchen/common area while the women were given more private spaces. There was running water and toilets with proper flush and all, but there were almost 40 of us and only a limited number of facilities. What do you do in that situation? Splash around in the river right next to the station, of course! The water was clear and since it hadn't rained in awhile when we visited, the river was tame. It was so refreshing. Plus, not having any connection to the rest of the world was quite liberating and allowed us to create a bond that may not have been possible otherwise. After we freshened up and had dinner, a long discussion ensued as to whether we should stick to our original plan of going to the more challenging Kuli Waterfall or the easy but equally pretty Maya Waterfalls. The next morning saw us waking up at 6am to have breakfast and pack some lunch before heading to the Kuli Waterfall at 7am. There was no easing into it. The trail began with a river crossing - which we managed without getting our shoes wet by hopping from one stone to another - and a steep climb. Caution: A proper hiking shoe with good grip is very important for this path, as I found out the hard way i.e after several falls - one of which left my left knee swollen and hurting for a week after. Try to befriend the rangers who will be guiding you as they have an abundance of knowledge to share. Our questions, eagerness to document everything (part of is was for work, but personal satisfaction played a part too), and curiosity did slow us down a little. We still managed to reach the waterfall in a little less than two-and-a-half hours, which was the expected duration for the hike. We have to warn you that some parts of the hike is truly nerve wracking as you'll be at the edges and careful navigation is necessary. But boy, is all the huffing and puffing, falls and strains worth it! The view and experience at the waterfall is one we will remember with awe for a long time. We decided to take a dip, and hundreds of photos despite not bringing a change of clothes and I'll repeat, #NoRegrets. We cannot imagine how it could be so, but the waterfall is said to be even more beautiful when there's more rain. The pictures that the rangers showed us was almost unreal! I guess that calls for another visit. The journey back was a little more challenging since we were going downhill on steep grounds. After falling several times, some of us were extra careful so the rangers made us 'tongkats' from fallen tree branches. It helped, but we still took a little bit of time getting back. Arriving at the Kuli station, wet and tired, we were greeted with a loud cheer from those who stayed back or went to Maya Waterfalls. It was a cheer that gave us an extra boost to cross the river and rest up for a bit. Despite the tiredness, the journey did not end there. We had to make our way back to ICSC, which if you remember, involved another trek and almost an hour ride. Food and rest always help, so it wasn't as bad as all that but we were grateful that we made our way back to the vehicles before it started to drizzle. That night, all we could do was nurse our injuries and aches, in preperation for our long ride back the next day after the launch of ICCA by the Sabah Chief Minister Datuk Seri Shafie Apdal. If you have the time and energy, you can also go on night walks. 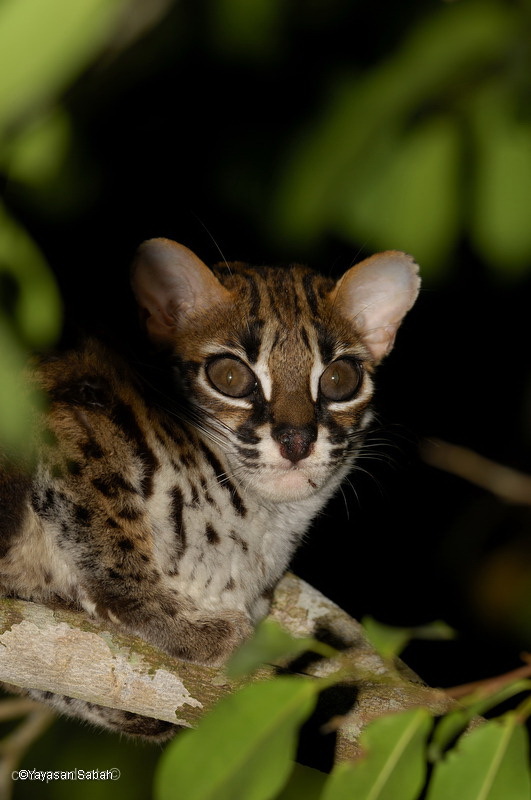 Many of the animals at this particular forest are nocturnal so this will be your chance to spot some of them. Don't be surprised if your attempts don't bear fruit though as the animals are not used to humans, and as such are too shy to show themselves. If you do see them, never ever go near or startle them. As one of the rangers, David, shared, even someone as experienced as him has been chased by an elephant that felt threatened by his presence. Also, it's really disrespectful. As a fellow nocturnal introvert, this writer can confirm that anyone entering our little bubble will be immediately labeled as a threat and dealt with accordingly. 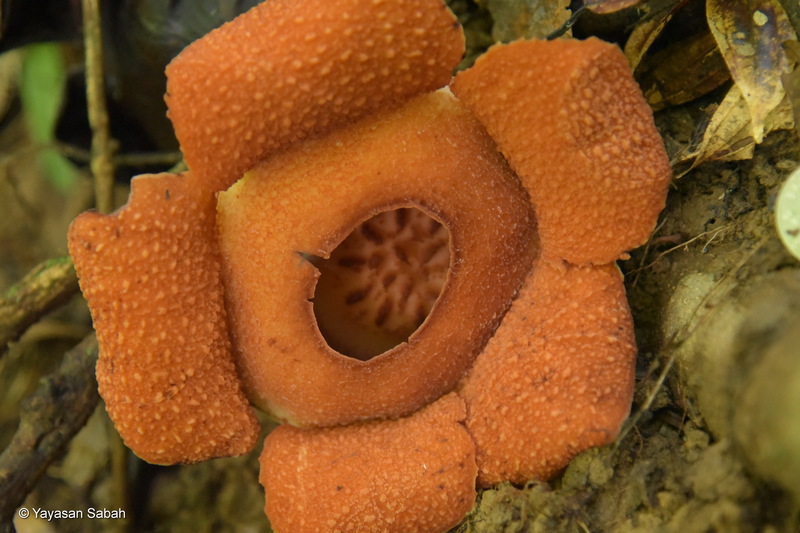 The forest is also filled with fascinating flora and fungi, such as the smallest rafflesia (which is still pretty big), several types of orchids and telinga tikus mushrooms. On our last day at Imbak, things got serious. The chief minister arrived in a helicopter for the launch, causing all our drying clothes to fly away. It was a pretty impressive show...but just the arrival. Once all the formal events were over, it was time to leave the jungles to its original owners and those working to keep it safe and learn from it. But the memories made, and the pictures and videos taken will forever be a reminder to those of us who went there. 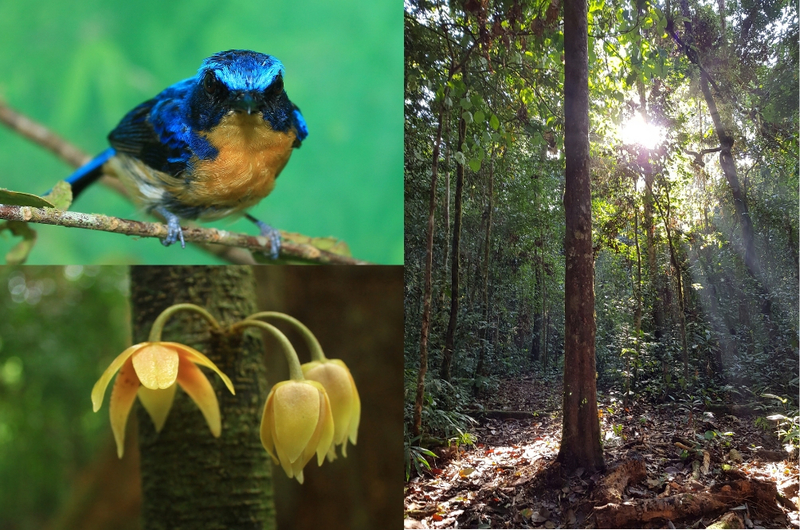 We will also keep bugging all our friends and readers to go to Imbak Canyon to create awareness, contribute to the running of the place in small ways and to ensure that it will continue to be a protected area.